This is an alkaline water pitcher with 6 filters. On the top of the pitcher is a timer. You use the timer to countdown from 60 days or 2 months to let you know when it is time to change the filter. Each filter contains: Activated Carbon, Ion Exchange Resin, Negative Potential Ball (ORP) and Tourmaline. 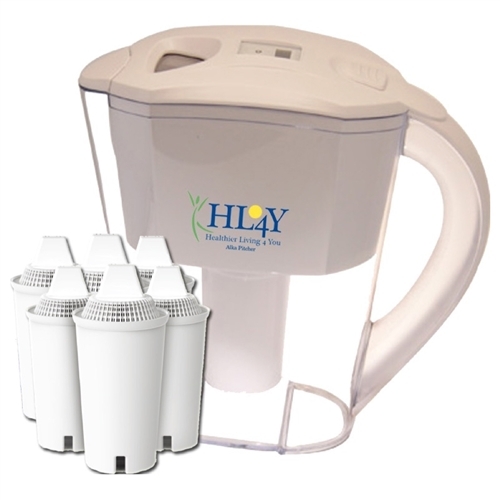 Each filter can effectively replace as many as 300 standard (500 mL) bottles of water. That means that 300 X 500ml = 150,000ml of water or 150 Liters of water. You might not use that much in 2 months, but it is advised to change the filter every 2 months.